COFI president and CEO Susan Yurkovich welcomes attendees of the 2018 COFI Convention in Prince George, B.C., in April. What’s the largest gathering of the forestry community in western Canada? The annual B.C. Council of Forest Industries (COFI) Convention. “Each year, this event brings together industry executives, managers, suppliers, businesses and government and First Nations leaders, to discuss key issues and opportunities in the B.C. 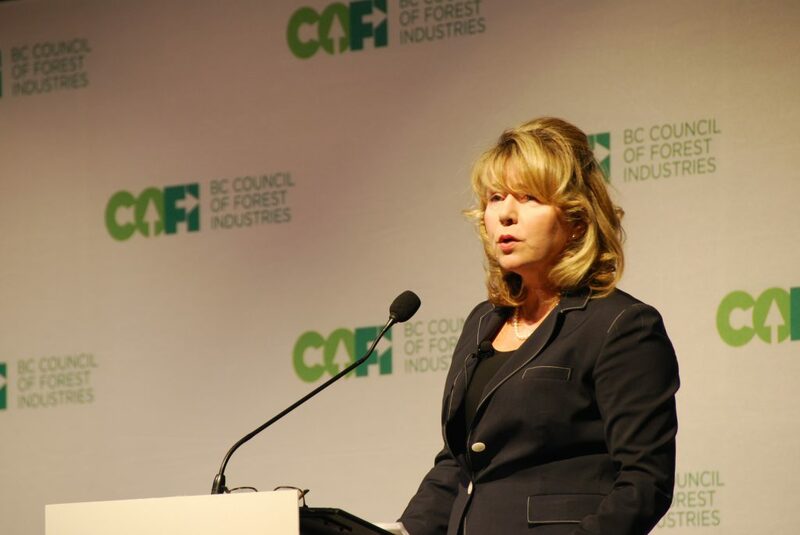 forest industry,” COFI’s president and CEO Susan Yurkovich told CFI. This year’s convention is no different, although it has a new location: the new Parq Vancouver Hotel and Convention Centre. From April 3-5, attendees will hear updates on markets, policy, trade and technology from several speakers, panelists and presenters. In the past year, lumber prices reached an all-time high and then experienced a precipitous drop. That price change, along with U.S. tariffs and a constrained log supply, prompted many of B.C.’s biggest producers to curtail production. At the conference, B.C.’s forestry CEOs will share their views on the state of the industry during the popular CEO panel. Meanwhile, “young forestry leaders from several B.C. companies will offer their assessment of where the industry is going and the opportunities and challenges that this next generation anticipates,” Yurkovich said. It’s likely that one of those challenges is how to attract more young talent, both in the sawmills and in the bush. CFI’s 2018 Contractor Survey found that the average B.C. Interior contractor is 54 years old, while the average B.C. Coast contractor is 56, and nearly half of all B.C. contractors plan to leave the industry within the next five years. This poses a real problem for sawmills already dealing with high log prices and reduced supply. Addressing this and other challenges is key for the industry’s future. Last year, the convention sold out, and this year, hundreds of delegates and exhibitors are expected to attend. COFI’s special early bird rate is available until March 1, 2019. For more information and to register, click here.